As a powerful wizard threatens the Chosen from beyond the grave, can they unravel The Prophecy in time to save their world? Tasia is a very special Chosen. Warned to keep her distance from her brethren, she makes a fateful decision one night to assist an injured Shape-shifter. Suddenly, Tasia finds herself in the cross-hairs of Shifter mercenaries encroaching on San Francisco and their vampire allies. 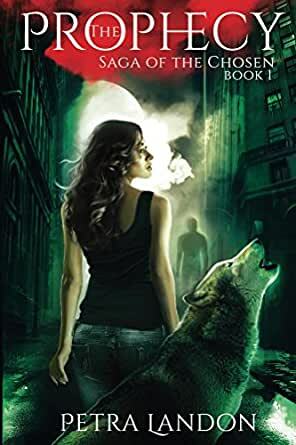 Forced out of the shadows, Tasia has little choice but to ally herself with the local Shifter Pack, led by a formidable and dangerous Alpha Protector. Amidst the volatile and aggressive Shifters, Tasia must fight to guard her secrets while struggling to negotiate with the enigmatic Alpha who holds his violent Pack together with a ruthless hand on its reins. "Surprising, unique, entertaining, The Prophecy is a humorous and modern take on werewolves, magic, and vampires. Petra Landon breaks stereotypes of these themes, creating layered characters that are flawed and real ... Landon leaves an impression through the characters. A must-read for any urban fantasy lover!" "The Prophecy is a fast paced and at times action intense story. Its packed with strong characters and backed by a highly engaging plot. What I enjoyed most was the completely new take on the paranormal world." "I think Landon is a bright new talent in the urban-fantasy world and I, for one, will be waiting with baited breath for the next offering from this uber-talented, debut author. A great job and kudos to the author. A five-star winner from this reviewer." "Great world building and amazing characters ... Can&apos;t wait for the second part to get me some answers." Author&apos;s Note : The Prophecy is the first book of Saga of the Chosen, an urban fantasy series sprinkled with action, adventure, an unfolding mystery and a dash of romance. Set in contemporary San Francisco in the fantastical and intrigue-riddled world of Chosen, it introduces Tasia, a Magick with dangerous secrets and deadly powers. Circumstances propel Tasia from a nondescript life on the fringes of Chosen society to a crucial role in an investigation to decode a mysterious plot from the past that threatens her people. Along the way, she gains new friends and allies while struggling to maintain a tempestuous alliance with the local Shape-shifter Pack. Thrust into a world where the line between friend and foe is often hard to decipher, Tasia must figure out the rules quickly even as danger stalks ever closer to her. The Rainmaker will be Book Two of this series. 4.0 out of 5 starsGreat Urban Fantasy read! Set in San Francisco, in a world where wizards, shape-shifters and vampires exist unknown to the human population, this is a captivating, action-packed and thrilling adventure. The supernatural world that Ms Landon has created is intriguing and I found myself totally immersed in Tasia’s journey. I instantly connected with Tasia; she is a likeable, spirited character and I felt for her struggle to survive and to find a place to belong. She is unsure who to trust and is in over her head with the politics and power plays of the supernatural clans. The plot was multi-layered and complex and the characters well developed; I enjoyed getting to know them as the story unfolded. There is so much that I loved in this strong debut novel. It is a rewarding, well-written and entertaining read. Ms Landon has introduced a great cast of characters in a fascinating world and I can’t wait to continue with this series. Kept me enthralled throughout. Loved the mix of characters and background. Now to book two ! This is Urban Fantasy. This isn't just another shifter story, this has so many elements involved that twine together to bring you a true Urban Fantasy. I loved everything about this book. Everything. Once again Petra Landon has brought a new refreshing story to us. This isn't the same old, this is something new and exciting. Tasia is a very mysterious character, after finishing this I still have questions! (I'm sure they will be answered in later books!) The same with Raoul. Both seem to have some pretty big tragedies and mysteries in their past. Tasia is a bit naive, but she's got a backbone and is a fast learner. When she saves someone she's never met who happens to be a Shifter, which she was warned about, she starts on an epic adventure. One thing I am coming to love about Petra Landon's books is that she successfully makes honest characters. I can see myself being best friends with Tasia, Hawk, Sara, and Sienna. I can see myself crushing on the imposing, strong, quick tempered Alpha. The relationships she writes are real and honest. You don't come across that a lot in books. Back to the story, Tasia receives Pack protection and comes to find out that she seriously needs it. She's been hiding herself for so long and hiding her magic that it's hard for her to accept allies. Because of this there seems to be some misunderstandings between her and the Alpha, Raoul. They both have a spark that I'm hoping develops into more in a later book. They seem to need to figure themselves out before they bring themselves together. I, obviously, loved this book. I loved the storyline which kept me intrigued the entire book. I loved the characters and want to become best friends with them. The writing was superb. I'm really looking forward to more from this series and from the author! 5.0 out of 5 starsthis was soooo good! All I can say if you love shifter books, with a really good story, a little bit of romance, it's really only in it's infancy but I just don't care, and I'm die hard romance lover.. This story was just so good, I don't want to say anything and spoil it for people, it's just that good, I went in blind and it was the best thing that I could have done. 4.0 out of 5 starsA promising start!!! There are some books that I hear about and wait anxiously for months and years to finally be released. Some of them receive a lot of attention and turn out to be the treasures they claim to be. Others turn out to be books I cannot stand. And then, every once and a while, I stumble across a book that I love so much I end up plunking it on my treasured “My Dragon Hoard” Shelf on Goodreads—my shelf for books that I absolutely love. This was the case for me with The Prophecy. I was browsing on Amazon, read an excerpt, and decided to give it a try. I expected an “it’s-just-okay” read even though I was hopeful it would turn out better. As it would happen, I ended up loving The Prophecy so much that its sequel, The Rainmaker, became one of my most anticipated sequels for 2018. The book itself centers around Tasia Armstrong, although the story is told through multiple viewpoints. Tasia is a Magick, a being with magic in her blood. Collectively known as the Chosen, four factions exist among these magical beings: The First Ones or Ancients, Wyrs or Shape-shifters, Wizards, and the Undead or Vampires (Blutsaugers). Discovering what exactly Tasia is, although she claims to be a Wizard, is part of the mystery for her heritage threatens her very existence. Tasia is living in San Francisco, trying to avoid unwelcome attention, when one night during her work as an Mfector cleaning sites where Chosen blood has been spilled, she comes across an injured and caged shape-shifter. When she makes the risky decision to come to his aid, she is thrown into the politics of the Chosen world. Eventually, she finds protection with the local shape-shifter Pack under the leadership of the enigmatic Alpha Protector Raoul, but her enemies are many and her journey is just beginning. Moreover, the Chosen world, already tumultuous, is thrown into further chaos as a prophecy, foretold years ago, once again begins to make itself known through the ambitions of those who seek to manipulate its outcome. One thing is incredibly clear: great change is coming. One thing I loved about this book was the characters. Almost nothing frustrates me more than shallow and underdeveloped characters. Happily for me, Landon's are wonderfully complex. By the end, I was not only rooting for Tasia, but also many of the secondary characters, including Hawk, Sara, and Duncan, to name a few. On a side note, interestingly enough I actually found myself connecting more with Raoul that Tasia. However, I enjoyed seeing her come more into her own as the story progressed and hope she continues to do so in the following books. I will admit that I was worried about the world-building at first because several aspects reminded me of a couple of popular urban fantasies that I had started previously (and admittedly quit for varying reasons), such as the Kate Daniels and Mercy Thompson series. However, Landon manages to add new twists to what has become popular lore regarding various supernatural races—not to mention that with every consecutive book in the series, she adds more intricacy and depth to the every-expanding mythology and cultures of the various Chosen factions. Although there were some bumpy moments for me, such as encountering abrupt transitions between several viewpoints and unusual punctuation, I loved Landon’s writing. The world felt so incredibly alive to me, and I was thrilled to dive even deeper into both the world and the hearts of the characters in this book and the sequel. I have so many questions that I cannot wait to see answered, from Tasia’s mysterious past to the fulfillment of a prophecy that will reshape the Chosen world as they know it. Not to mention, I am also eager to see how the bonds between various characters develop as the story unfolds. Petra Landon’s series shows so much promise. For someone as picky as me, finding a series like this was wonderful, and I have my fingers-crossed for the rest of the series. 5.0 out of 5 starsThe Prophecy-- a great read! While the geek in me hates the lack of proper punctuation-- seriously, it was consistently missing-- the reader in me absolutely loved this plot and the characters. A really unique and interesting story line, although with references to a Beast Lord and an Alpha Protector, the author touched dangerously on parallels with the Kate Daniels series' worldbuilding. We still haven't learned what type of shifter Raoul, the Alpha Protector, is-- if he turns out to be a lion, like Curren of the Ilona Andrews series, there will definitely be negative comparisons made. Overall--a great set of protagonists and interesting secondary characters. I will be waiting on book two. I hate reading any series but I just wanted a fun, light reading before bedtime. I was pleasantly surprised on different turns and plots in this story line. Plus, there is the hint of romance but not like some of the other fantasy series where that is the main focus of the book. I am looking forward to reading the next book.